With a focus on youth, opportunities and a creative process, WomenSing’s Commissioning Emerging Composers project, formerly known as Youth Inspiring Youth (YIY), provides the opportunity for young composers to create new choral music, mentored by internationally recognized composers. Through a blind application/submission process judged by WomenSing’s Artistic Leadership Team, up to two competition winners are commissioned to write treble choral works inspired by various texts, themes and collaborations. In Commissioning Emerging Composers (CEC), all participants take part in a series of events, including public workshops and WomenSing’s new music festival, Treble Voices Now, culminating in the commissioned works being premiered in concert by WomenSing. Since the program’s inception in 2008, WomenSing has commissioned twelve pieces. From the start, CEC has inspired unique collaborations. For its first eight years, texts for the newly commissioned works were provided exclusively by the award-winning children’s poetry from the River of Words project, which is part of the Center for Environmental Literacy at St. Mary’s College in Moraga, California. During its May, 2011 Washington DC tour, WomenSing presented YIY pieces in collaboration with the Peabody Children’s Chorus at a concert presented by the Library of Congress Center for the Book. Along with performances at multiple Bay Area concerts, YIY pieces have also been performed by WomenSing at the Washington National Cathedral, and at the Chorus America 2011 annual convention in San Francisco. 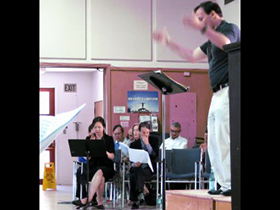 In the video above, see interviews with Martin Benvenuto of WomenSing, mentor Libby Larsen, and 2010 composers Elizabeth Lim and Joshua Fishbein. 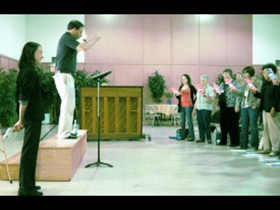 Clips from the 2010 workshop with Libby Larsen, the composers, and WomenSing provide an interesting look at the collaborative process. “With this program, the chorus is developing an avid thirst for being a part of the creative process,” Benvenuto says. “They are fascinated with trying things out at the workshop and seeing how these composers are thinking.” Womensing’s new music festival, Treble Voices Now, inaugurated in 2014, is bringing this inside look to an even wider audience, including high school choral students and the local community. 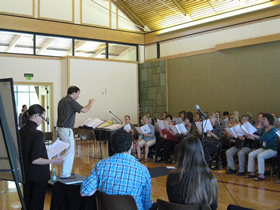 The photos below provide a glimpse of recent Youth Inspiring Youth Composers’ Workshops and the Treble Voices Now Festival. Click HERE for the video, where 2016 composer Margie Halloran describes her experience working with mentor Alice Parker. 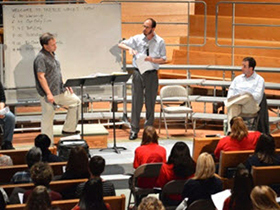 Treble Voices Now rehearsal in April 2014 with WomenSing artistic director Martín Benvenuto, YIY composer Jordan Nelson, and advising composer Cristian Grases. 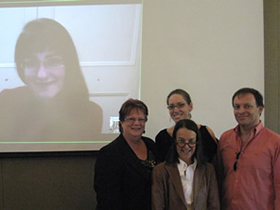 The 2012 YIY Workshop participants: YIY composer Anastasia Pahos (via Skype from Australia), advising composer Sandra Milliken, YIY composer Dale Trumbore (in back), teaching artist Libby Larsen, and Martín Benvenuto. 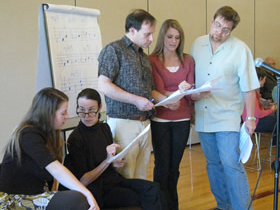 Discussing possible changes mid-rehearsal at the Composers' Workshop 2011: Composer Lauren McLaren, Teaching Artist Libby Larsen, Artistic Director Martín Benvenuto, and directors of collaborating high school choirs Sarah Downs (Miramonte HS) and Bruce Lengacher (Acalanes HS). 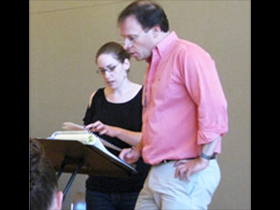 At the Composers' Workshop 2011: Directed by Martín Benvenuto, WomenSing Chorus sings the new compositions for Teaching Artist Libby Larsen, and Composers Nick Norton and Lauren McLaren. 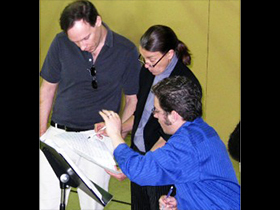 Martín Benvenuto, Libby Larsen, and Joshua Fishbein discuss the score of Unseen Secrets at the 2010 Composers' Workshop. 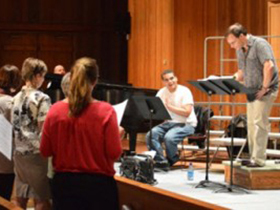 Libby Larsen looks on as Martín Benvenuto conducts WomenSing at the 2010 Composers' Workshop. 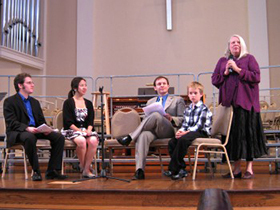 Joshua Fishbein, Elizabeth Lim, Martín Benvenuto, Quinn Whitlow, and Pamela Michaels at a pre-concert talk before the 2010 premieres of Unseen Secrets and Sisyphean. Elizabeth Lim and Libby Larsen follow their scores during the 2010 Composers' Workshop. The Youth Inspiring Youth Composers Public Workshop and Reception are funded in part through New Music USA’s MetLife Creative Connections program.